Global smartphone brand Vivo is introducing the notch and other advanced technologies to its Y-series with the release of the Y81. 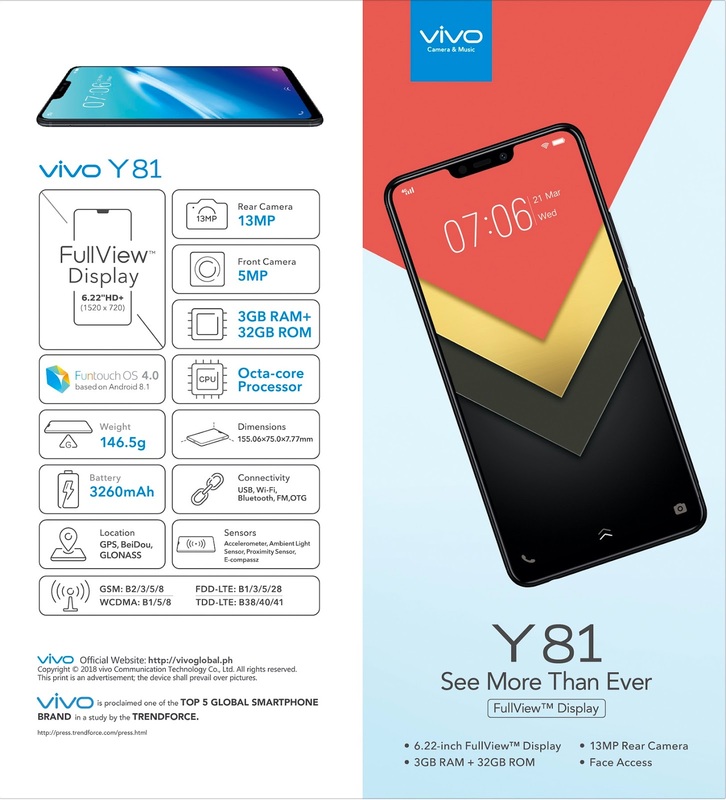 The Y81 comes with a 6.22-inch 19:9 FullView™ Display and an 88% screen-to-body ratio, allowing user to see more than ever. It also has Face ID Access for unlocking phones and apps in 0.1 second. Vivo’s new smartphone also has a 13-megapixel rear camera and a 5MP front camera with an AI-powered Face Beauty mode for more beautiful and natural selfies. Vivo Y81 also has a 3GB RAM and an octa-core processor that offers faster performance. Complementing its powerful performance is its 32GB internal storage that is expandable to 256GB to gives users the freedom to save more fun apps and unforgettable memories. The Vivo Y81 runs on Android Oreo 8.1-based Funtouch OS 4.0. It is available at authorized shops nationwide for only Php9,999.